The ancestral home of House Tully, Riverrun, sits at the junction of the Red Fork of the Trident and the Tumblestone River. The ruling Lord of the Riverlands, House Tully embodies the power and ferocity of the rivers it sits between. Using the power found in their positioning, House Tully forged strong alliances and built a history of honour, family and duty. Built along the banks of the River Fiddich, Glendullan Distillery originally relied on the waters it lay beside, using a water wheel to power the entire distillery. 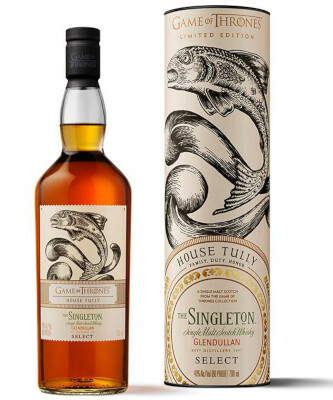 Like the Tullys themselves, this single malt can benefit from a splash of water, opening up flavours of green apple, honey and sweet vanilla.